Which Country Use Code +191? – footsteps…….. Which Country Use Code +191? This evening I received a phone call and the number registered on the screen was +191 63676099. With the + sign means its come country code for mobile communication. My son received the call and when he pass over the phone to me, I heard the voice of a lady of Indian accent. Well, not sure whether she is Indian or other race. She did mention my name correctly. I just listen what she has to say and after a few Hello, and I kept quiet the call was terminated. Well, then only I check the number and found out it was a foreign number. I remembered a few days back there was also a missed call from oversea +191 62186744. Who or where was the call from? Since I can’t make up the origin of the country code I checked the internet for the code but no such code number. So i just search for +191 and found this page www.800note.com/forum This is a directory of unknown callers. Read this Forum. Wiki. 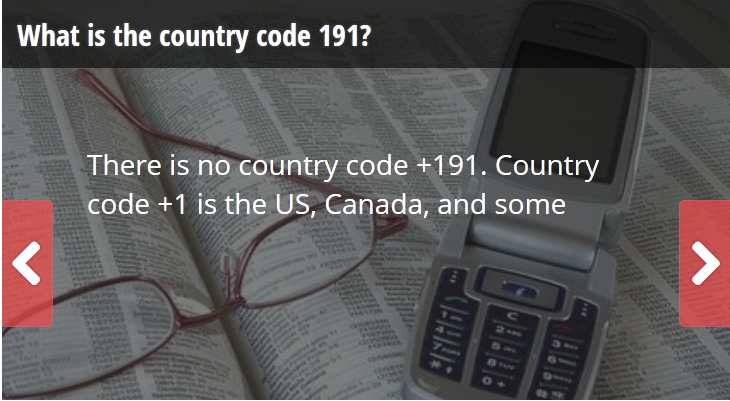 answer mentioned that there is no country code for +191. Yahoo answers also did a search for Country code +191 but did not get any answer. This is Yahoo answer: Did a search on the internet and couldn’t find a country with this number. Maybe it’s something created by an internal telephone system but not sure. Sorry to be of no further help. By the Way, +91 is India ( I couldn’t find +19) just in case and 01913 is the Regional code for Durham in the UK. So, the next time if you receive a call bearing +191 it just might be a call from your neighbor who manipulate the communication line to pose as oversea call and con you. Read about this 16 way you can be phone scammed. Travel fanatic, nature lover, adventure junkie, and photography enthusiast.